Screenshot of my Armada M300 as a lean, mean Google Reading machine! Given this is Sunday (as of two minutes ago), I thought it would be logical to post a Sunday blog post. That was an entirely irrelevant and superfluous sentence; then again so was this one. And this one too. I’ve started getting into the habit in Adelaide where I’m studying to catch up on my latest Google Reader and Bloglines feeds first thing in the morning and before I go to bed on my cute 2002-vintage Armada M300 subnotebook in my room because it’s interesting but also relaxing. At these times of day there isn’t much light out so I have an even lower tolerance for Blazing White® website themes, so I decided to completely re-theme the entire interface of the machine to accommodate my picky eyes. 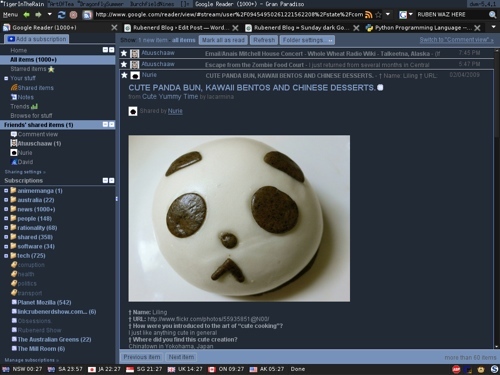 ASIDE: This bizarre post is mostly geared towards Linux, FreeBSD and whatnot, but the browser specific whatnot could be adapted if you have a Mac user or if you use that obscure operating system a small software company in Redmond makes. Firstly, if you’re a Mozilla Firefox or Opera user with Greasemonkey or an equivalent user style engine, I’ve found the Google Reader Dark-Blue-Grey user style by hronir to be by far the most readable dark theme. If your machine has limited screen real estate like mine, the Google Reader Maximize Vertical Space script by Chase Seibert makes a huge difference, and plays well with the colour changes — an important consideration! Next the browser itself: I first downloaded the beautiful MidnightFox Dark Firefox Theme which I’ve had lots of success with on my MacBook Pro, but then I thought I might as well take advantage of the fact Firefox is a GTK+ application and use a theme that would affect all the applications I use. I really love the dark Xfce-dusk theme, so I downloaded the Xfce theme package and added the following line to my ~/.gtkrc-2.0 file. If you’re using a desktop environment you’d probably want to use it’s theme selector. The results are what you saw at the beginning of the post. I love this colour scheme so much I’ve even started using it for when I’m writing code and assignments because it’s so easy on my eyes when stared at for hours on end. Good times ^_^.